Shopping centres where the data collected is compared to the installed automated system in order to determine the accuracy of the system currently in place. Outdoor events to understand visitation. This is very useful where the event is non-ticketed or open to public. Intersection usage and behaviour to determine if crossings are placed appropriately and whether the phasing of traffic lights is suitable. Demographic studies to report ages or genders of people. TCS For Surveys has the experience and capabilities to undertake a people counting survey audits. These audits are necessary from time to time to validate the accuracy of people counting systems installed on the doors of shopping centres and retail outlets. Our team can check door counts across your centre to determine the accuracy of any installed system. Our traffic video cameras can also provide pedestrian and cyclist surveys at both prioritised and non-prioritised intersections capturing pedestrian and bicycle movements on all intersection legs for either 5 minute, 15 minute or 1 hour duration time periods. These movements are helpful in intersection and traffic signal phasing design. 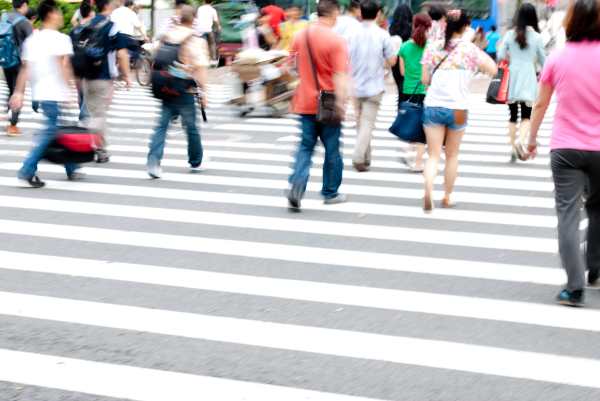 Additionally, our pedestrian surveys can include an analysis of pedestrian behavioural traits such as preferred movements and desire lines, which can assist in the the design and optimal placement of pedestrian (or zebra) crossings. This can also help traffic engineers understand the interaction between traffic and pedestrains at a traffic intersection. Many pedestrian and bicycle surveys are completed in conjection with an intersection traffic survey. Together these surveys provide valuable information and analysis on the interaction between vehicular traffic, pedestrians and cyclists on our road network. More information on intersection traffic surveys can be found here. Alternatively, bicycle counts can also be accomplished using pneumatic tubes and traffic data loggers using specialised light weight tubing developed specifically for bicycles. These surveys can be sued to determine speed of cyclists in addition to the volume. More information on our ATC traffic surveys can be found here. TCS For Surveys can provide traffic analysis and data for a range of applications for traffic and road network and transport design and planning for government agencies to traffic movements and requirements analysis for development applications for consultancy and construction organisations. Please contact us here for more information about your customised requirements.